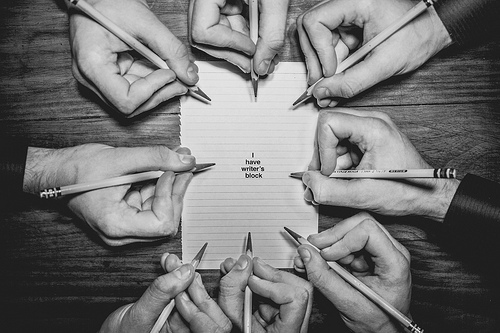 (All words and photographs by Chris). With its extensive line-up of rugged all-purpose all-terrain vehicles and luxury appointed Range Rovers you would imagine that Land Rover has all the bases covered when it comes to four-wheel drive – but apparently not. 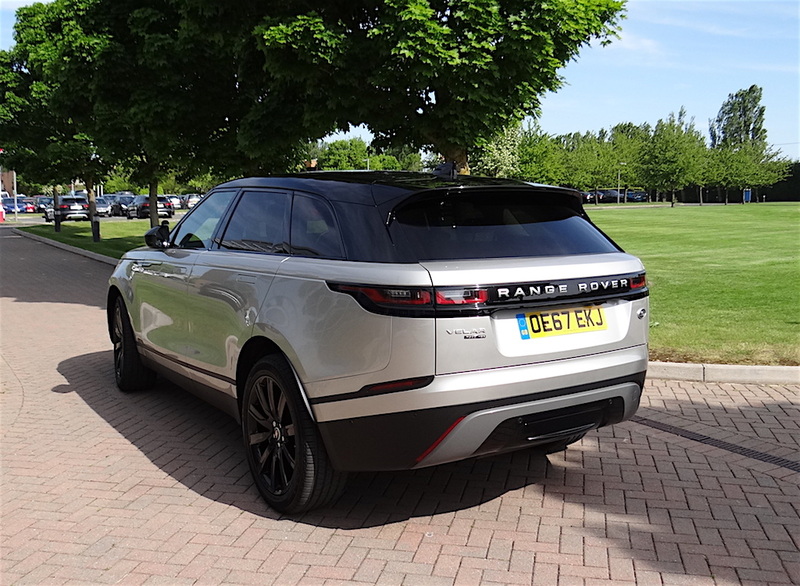 Into the already crowded Land Rover showrooms comes the Range Rover Velar, positioned between the Evoque and the Sport – if the name sounds familiar it’s because this was the code name Land Rover used for the prototype Range Rover back in the late 1960s. As well as the name sounding familiar, so too is much of the appearance. While perhaps not quite as startling as the Evoque, the Velar combines Range Rover essentials such as the clamshell bonnet, broad honeycomb black grille, slim-line headlights and tall stance with a few individual touches such as retracting door handles. 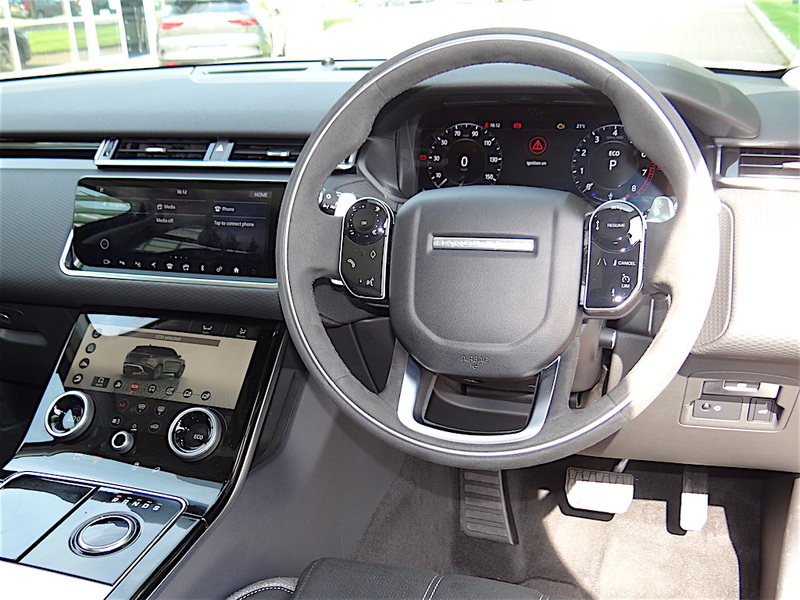 However, it is inside that the Velar really creates its own character with a high quality, high tech look which is more cosy wrap-around cruising executive saloon than family runabout. The cabin is dominated by a huge pair of touchscreens positioned one above the other, and which control many of the on-board systems, media settings, climate functions etc. 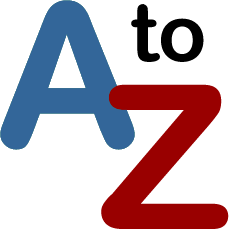 For my taste there is too much going on and an overload of information (such as live traffic updates and fuel prices) which can be distracting for a driver who just wants to go from A to B. But I suspect Land Rover has done its research and the target market that can afford this vehicle probably already own £1,000 plus iPhones and need this amount of information on tap to run their lives. 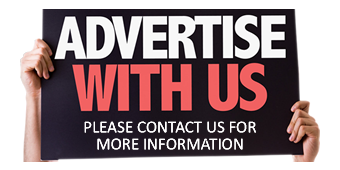 No complaints however about the comfortable driving position and generally good all-round visibility which makes it feel more like a sophisticated saloon than an off-roader – the give-away however is the high seating positon. 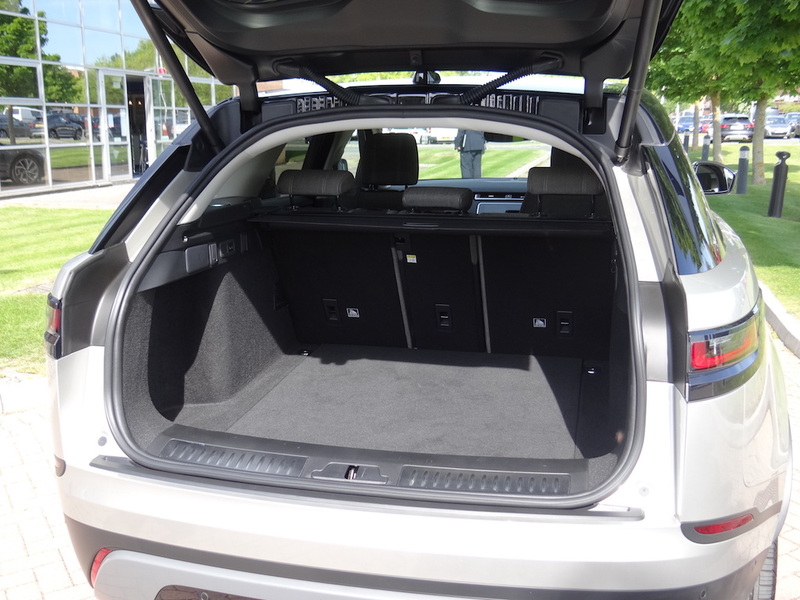 A higher rear roof line than the Evoque means rear seat occupants get more head room but the leg room isn’t that extensive. Luggage capacity is a generous 632 litres (22.32 cu.ft) which can be increased to 1,690 litres (59.61 cu.ft) with the versatile 40 / 20 / 40 split rear seats folded down. Velar comes in four trim levels topped by the HSE (as tested here) with a price tag that starts at £65,000. For this, owners will expect plenty of high tech features and the Velar doesn’t disappoint with items such as two-zone climate control, ambient interior lighting, Bluetooth, a 250W eight speaker sound system and cruise control, although I was surprised to find that 20 way electrically operated heated and cooled front seats and a rear parking camera are listed as a no cost option – who wouldn’t have them? In this class the Velar does seem a little under-equipped unless you dip into the options bin where you can add in things such as metallic paint (£1,450), privacy glass (£390), sliding panoramic roof (£1,395), 21 inch gloss black wheels (£415), electric towbar (£985) and cloth and suede seats (£620). 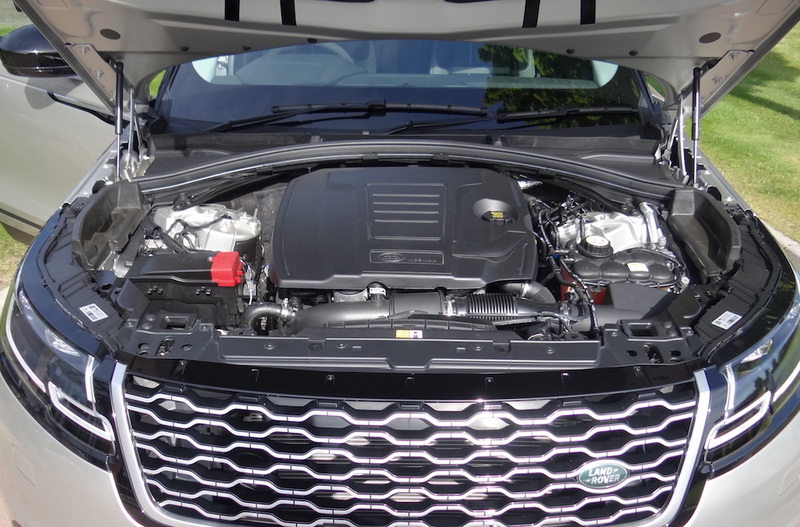 At one time you would have expected the diesel engine options to be the big sellers in the Range Rover sector but, with improved technology and diesel getting a lot of bad press, the two petrol options might be a better bet and for performance the entry level four-cylinder twin-turbo charged 2 litre is a respectable performer. The statistics show a sprint time of six seconds to 62 mph, which is quick enough for a 4×4 and the unit responds well with lots of flexible torque operating through the eight-speed automatic transmission, so this is very much a driver’s car at heart. Stop-start technology means that at the same time it can return in the mid 30 mpg bracket while emissions are well below 200 g/km. As you would expect of a Land Rover the Velar is bristling with technology designed to get it over most of the terrain that Britain can put in its path. The list of road and off-road holding systems (with a mode selection dial) would fill a handbook on their own: Terrain Response, Adaptive Dynamics, Hill Descent Control, Hill Launch Assist, Gradient Release Control, Electronic Traction Control, Low Traction Launch, Dynamic Stability Control, Cornering Brake Control, Electronic Brake-force Distribution, Roll Stability Control and, for those into towing caravans or a horse box, there is Trailer Stability Assist. Most of the time users aren’t going to realise these technologies are working; all the driver knows is that the Velar feels extremely stable and controlled on the road – the makers even specify all-season tyres so no need to worry about changing them in the winter. 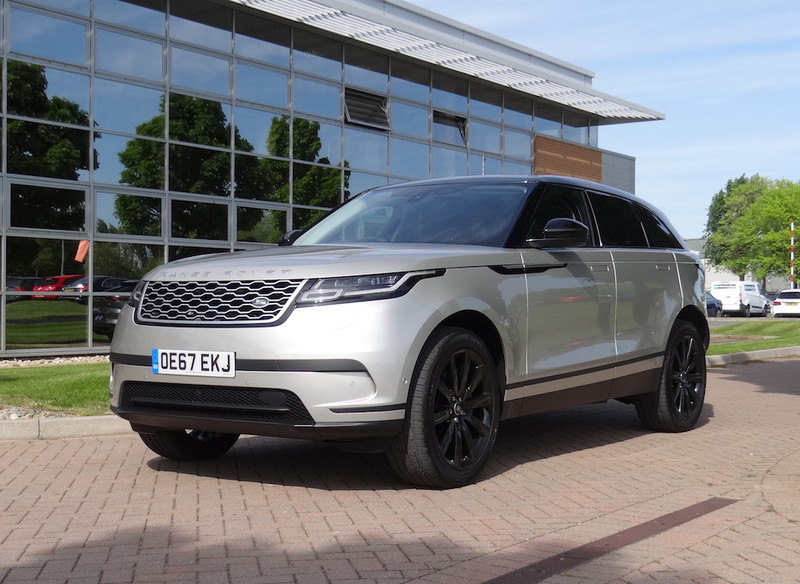 The use of large 21 inch wheels can make the ride seem a tad firm and irritating at times, even with the coil sprung electronic air suspension, although that is more to my taste than the soft wallowing sensation you sometimes get in a Range Rover. 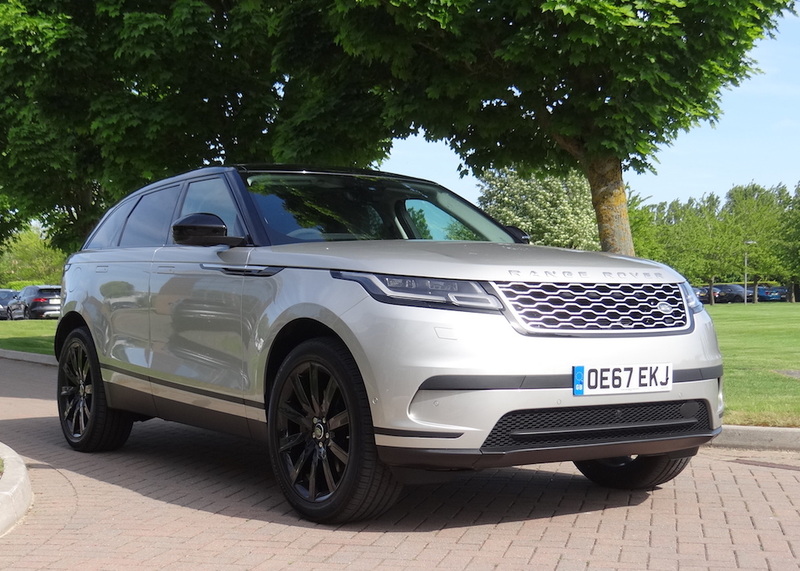 Speed proportional electric power assisted steering gives the Velar a more sporting feel at the wheel and, when combined with the punchy acceleration on tap, makes this one of the most enjoyable Range Rovers to drive on twisting country roads. With so many excellent models already in the Land Rover stable it is difficult at first to see where the Velar fits in – for me it’s the Range Rover to have if you want an engaging drive rather than something that just looks good.